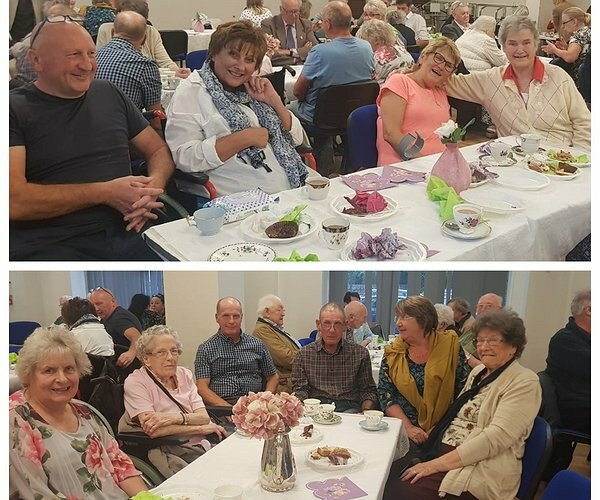 People who are due to move into Hafan Cenfi, the new extra care apartments in Llangefni, met up for afternoon tea last week to get to know their new neighbours and scheme staff, ahead of the development opening later in the Autumn. “It was wonderful that so many of our new tenants and their family members were able to join us and share some laughter along with a cream tea, getting to know each other,” said Brenda Hughes, Extra Care Officer with Clwyd Alyn Housing Association who will manage the scheme in partnership with the Isle of Anglesey County Council. “The beauty of extra care is that the self-contained apartments allow people to remain living independently in a home of their own, while also having access to a wide range of communal facilities and access to 24-hour care. The scheme has 63 apartments and is purpose built to meet varying levels of care and support needs including 15 apartments specifically designed and adapted for older people living with memory loss or dementia. The scheme also features a restaurant and café along with a buggy store for mobility scooters, a guest suite, laundry room and a residents’ lounge and hobbies room.